New Foiling Trimaran by Manu Boulogne, code name "Project M" . Amas are without a doubt (in my mind at least..) Cirrus R F18 hulls, which shows L foil placement in the central plane. This is somehow strange for a new project as we've seeing on the A-Cats where span is maximized on the board bottom exit to outwards. But also might be a simple built/structural convenience to place the boards in the center plane, as this project has no inwards span restriction as the As (150cms from each Z board tip), and maybe maintain F18 hulls usable too. Manu will also launch an updated Cirrus R2 F18 , which already shows a bow cut , and I don´t think it will have any further mod, maybe a convertible box ? This Cirrus Trimaran features T rudders and seat wings. 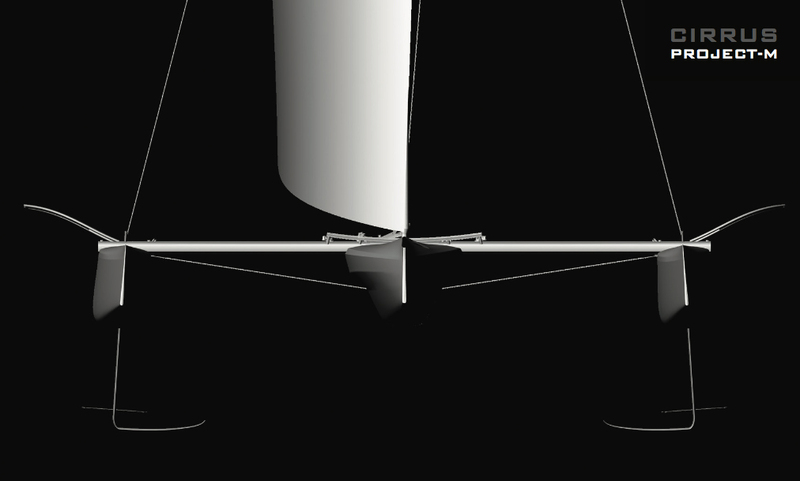 The L foil used in the Project M render resembles latest design we've been seeing from Bermuda AC45 Turbos. Leaving out Team New Zealand J or L/V shape. The AC45 Turbo and AC50 have active rake trim controls, thus they can go for that less forgiving hard L shape (remember first Oracle AC45/AC72 foiling attempts...) so we don´t know yet which trim control, if any this Cirrus Tirmaran will use. Total lenght of central hull might be near Diam24? We'll see, in any case this foiling Tri looks fast and high flying machine. Happy for Manu Bouglone , one the great guys the beachcat community has around, continue to innovate.